I publish the results of my work on deciphering Johann Bessler’s code, found in his published book, Apologia Poetica, and in particular Chapter 55, on my web site at www.orffyreus.net. This site is often updated as and when new information is discovered. I have placed a large amount of additional information concerning Bessler’s Code on another web site at www.theorffyreuscode.com. This site includes all the information concerning Bessler’s code that I have found so far, in all of his four publications as well as elsewhere. My website at www.gravitywheel.com contains some considerations on how gravity could power Bessler’s wheel and also some more speculative interpretations on particular pieces of coded information Bessler left for us. ‘Perpetual Motion; An Ancient Mystery Solved?’ - the complete biography of Johann Bessler, aka Orffyreus, by John Collins, is available now, from this web site, in both paperback and digital format. 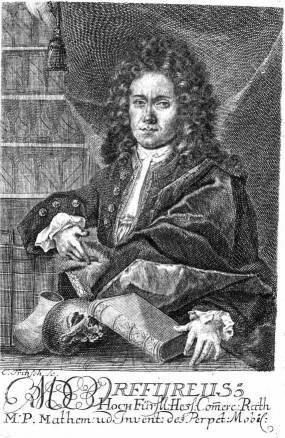 ‘Maschinen Tractate’, ‘Apologia Poetica’, ‘Grundlicher Bericht’ and ‘Das Triumphirende’ are four books originally written and published by Johann Bessler. Copies of them are available with full English translations from this web site, in both hard copy and, digital PDF files. All digital books from this site £5. or about $8 each. The incredible Legend of Bessler’s Wheel, also known as Orffyreus’ Wheel, has been recounted several times over the years but most accounts rely on previous attempts to tell his story and this has resulted in mistakes and inaccuracies being compounded to the point that it is difficult to know what is true and what is myth. When poetic licence is added to the list, as is true of one well-known account, the facts of the story become so confusing that most people believe that the whole thing was a myth. My book details everything that I found about Johann Bessler and his wheel from thirty years of research. I obtained records from Germany, France, Russia, Italy, the U.S.A and England and translated documents in four languages into English. I spent hundreds of hours reading documents, sifting through letters, studying old records and searching the major libraries of the world to try to get to the truth and everything relevant was included in my book. I first posted this web site in 1997 and at that time the name ‘Orffyreus’ generated just one result in any search engines of the time. Now it finds about 14000, and so I feel that I have brought the world’s attention to this remarkable man. In these worrying times of global warming, possibly due to carbon pollution; the rapidly diminishing oil reserves and the search for a cheap, clean, alternative energy source, I find it remarkable and frustrating that there appears to be a viable solution to all these problems, namely Bessler’s wheel, but no one is taking any real notice. Those who are taking notice, are, like myself, lone voices in the wilderness. It’s time to sit up and take notice. Taken a face value, Johann Bessler appears to have solved the problem of using gravity directly, as a continuous source of energy. Eyewitness accounts in both letters and certificates provide excellent circumstantial evidence that the man was genuine and his own writings ring with the sound of conviction. The great Gottfried Liebniz was convinced that the machine was genuine, so why are we ignoring this extraordinary machine? The truth is that we believe that machines which rely on gravity as a source of energy violate the laws of physics. That is what we have been taught, but suppose that we were wrong. What if it were possible to interpret the laws in a slightly different way and recognise in a local situations certain effects might be read differently. Surely if the empirical evidence is convincing we should take another look at Bessler’s wheel to see if it might be possible reconstruct it and make it work without bending those laws upon which we depend?